Objectives: Diagnostic laparoscopy is an established tool in oncologic evaluation. Standard rigid laparoscopy presents certain limitations in terms of access to various areas of the peritoneal cavity. Other authors have explored the utility of diagnostic laparoscopy with a flexible endoscope via a transgastric or transvaginal approach (NOTES). Our goal is to determine the effectiveness of flexible endoscopy as a tool for diagnostic peritoneoscopy using a transabdominal approach. Methods: Five 25-kg female swine were subjected to general anesthesia. Pneumoperitoneum to 15mm Hg was achieved with a veress needle. Using a laparoscopic tacking device, 4 tacks were place on the peritoneum in random locations. A separate surgical team that was not present during placement of the tacks then introduced a 2 channel, Storz gastroscope through a periumbilical incision. The team was asked to localize the tacks using the flexible endoscope. Results: Average time for complete exploration and detection of 4 tacks was 20 ± 10 minutes. Two different surgeons with varying degree of expertise with flexible endoscopy were able to detect all the tacks in 5 pigs with a sensitivity of 100%. The subdiaphragmatic area was visualized in all the cases. 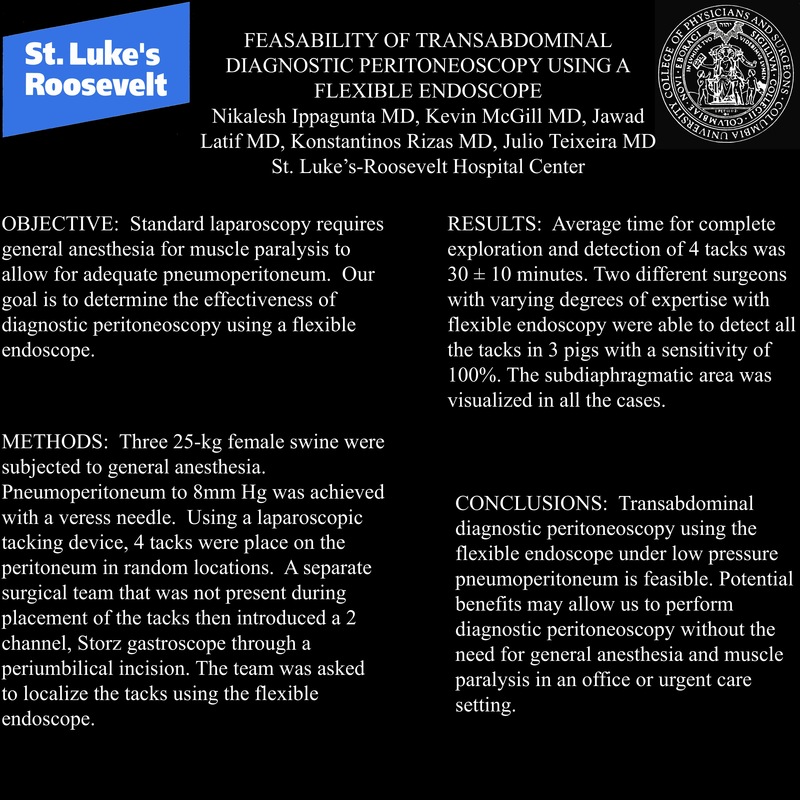 Conclusion: Transabdominal diagnostic peritoneoscopy using the flexible endoscope is feasible. Potential benefits may allow us to access areas of the peritoneal cavity that were otherwise difficult to access with rigid laparoscopy.